Four UFC fighters were rewarded an additional $30K each for their special performances tonight at UFC Fight Night 18 in Nashville, Tennessee. 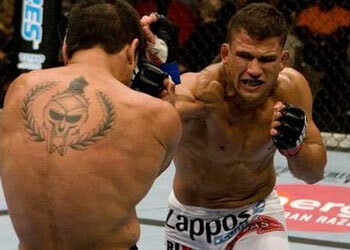 Tyson Griffin and Rafael dos Anjos treated the fans inside of the Sommet Center to an action-packed 15-minute affair. Although Griffin won a unanimous 30-27 across the board, dos Anjos came close to catching the Xtreme Couture fighter in a few submission attempts. It was an easy $30K for Aaron Simpson, as his 1stRound TKO over Tim McKenzie was the only knockout of the evening. It took the Arizona Combat Sports trained fighter all of 100 seconds to pocket the cash. Rob Kimmons also decided that he wanted to hit the showers early as it took him 1:54 to sink in a guillotine choke around Joe Vedepo’s neck. These bonuses matched the stipends rewarded at UFC Fight Night 17 in February.